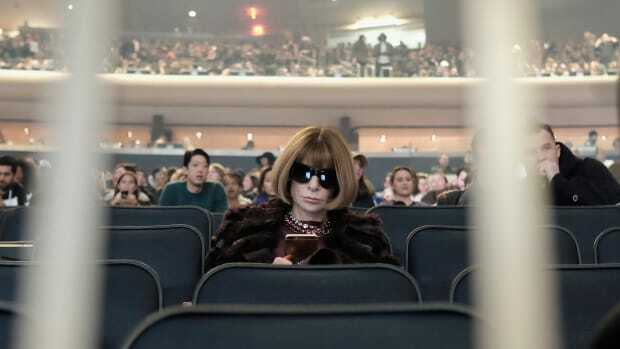 Anna Wintour&apos;s fondness for Seth Meyers is well documented: he hosted the 2012 CFDA Awards, he&apos;s appeared in Vogue (and its website) on numerous occasions, he interviewed Wintour on "Late Night" following the 2014 Met Gala and his show even employs her daughter, Bee Shaffer. But, what if there&apos;s more to this chummy relationship than meets the eye? This is what a new sketch from "Late Night With Seth Meyers" wants us to believe, and viewers are introduced to a never-before-seen side of the Vogue editor for the first time: Anna Wintour, the comedy icon. In the hilarious clip, Wintour is revealed as the true creative force behind Meyers&apos;s show, approving every joke (much like she would do with clothing in an editorial run-through), delivering harsh criticism on the sketches and driving the entire writers room to wear nothing but tuxedos and ball gowns to the office. While the icy persona she&apos;s become known for at Vogue is flagrantly on display here, she&apos;s hilarious, and it&apos;s endearing to see that she&apos;s in on the joke — especially when Meyers, in a heated moment, launches an off-the-cuff rant about her wearing sunglasses inside the studio. Watch the clip above to see her run the show at "Late Night" and, spoiler alert, reduce its very famous host to tears. Spoiler alert: Only one man seemed to get it right.